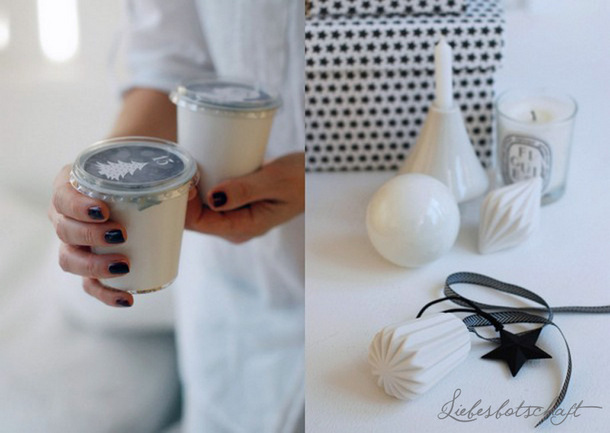 Liebesbotschaft International: 4 steps to casual + most beautiful Holiday decorating. 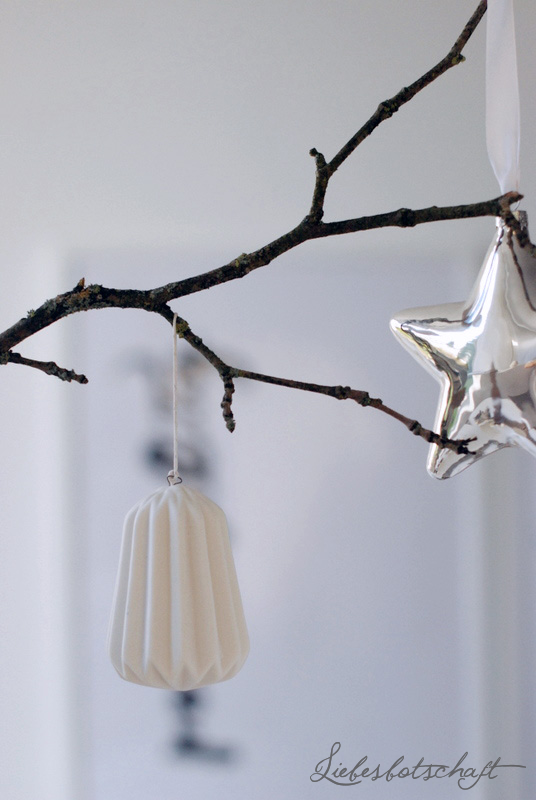 4 steps to casual + most beautiful Holiday decorating. I have never decorated for the Holidays so fast and in such a relaxed manner than this year – and I think it turned out more beautiful than ever! 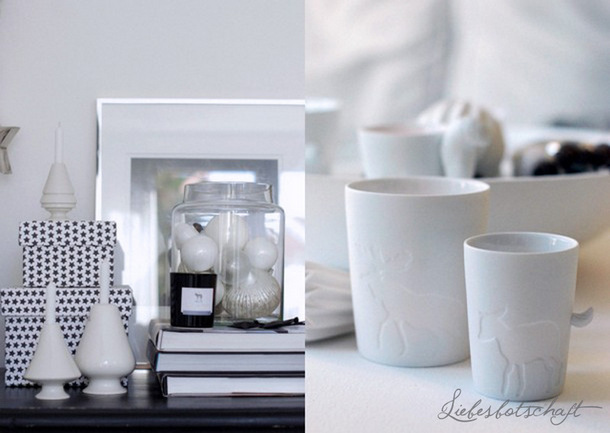 Everything is both casual and sophisticated – just exactly my favorite mix. ... represent pure Holidays spirit for me – that’s why they make an appearance as early as possible, not only hung on the tree. For this purpose I added baubles of different shapes and sizes – but similar colors (in my case silver and white) to tall glass receptacles. 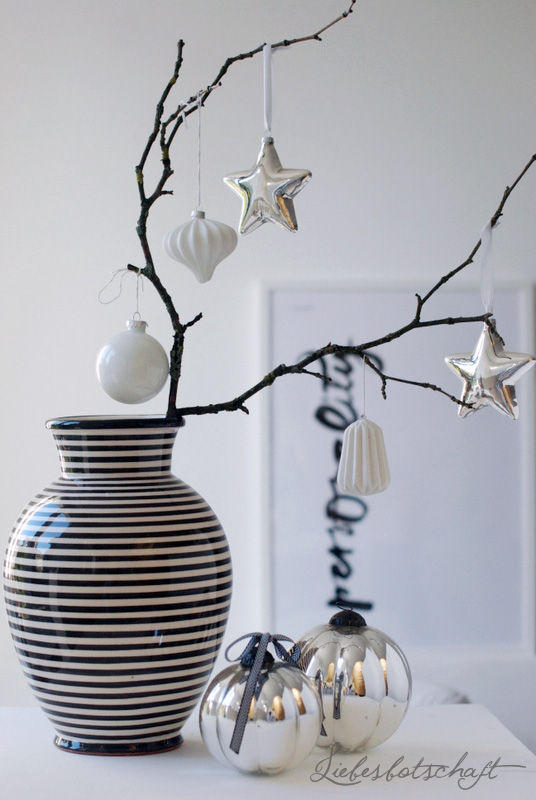 You can use tall vases for this, bowls or hand lanterns – even big storage jars are suitable. 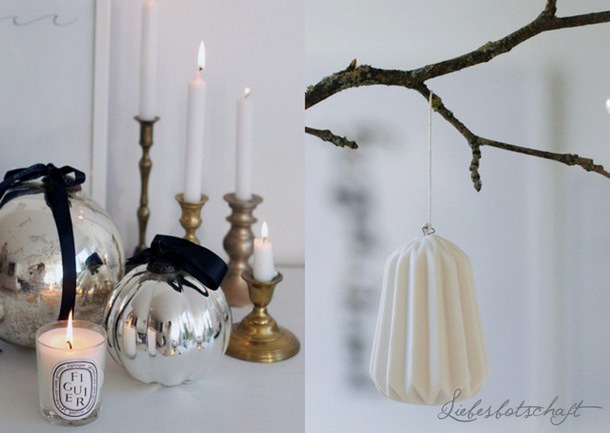 In order to freshen up the decoration I added a handful of baubles in geometric shapes to the simple white glass baubles that I have owned for years – I think they match perfectly! 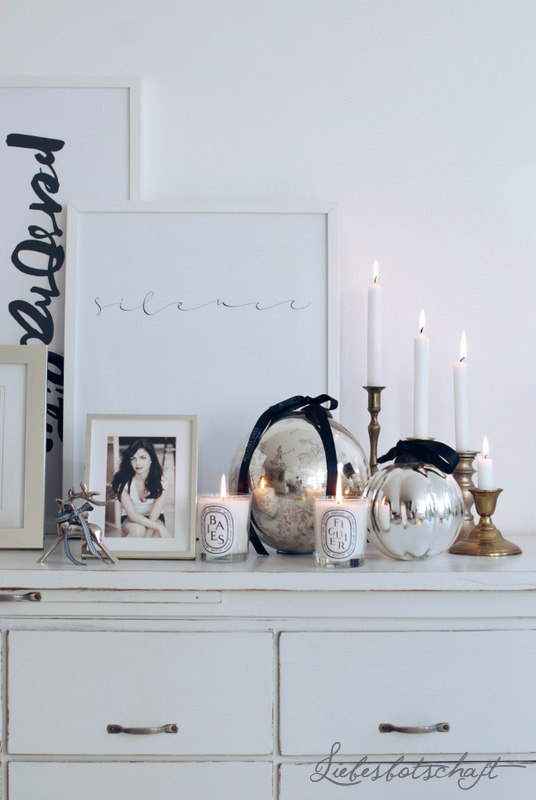 I tied a black silk ribbon to particularly big or decorative glass baubles and placed them with the groupings of picture frames and candles. 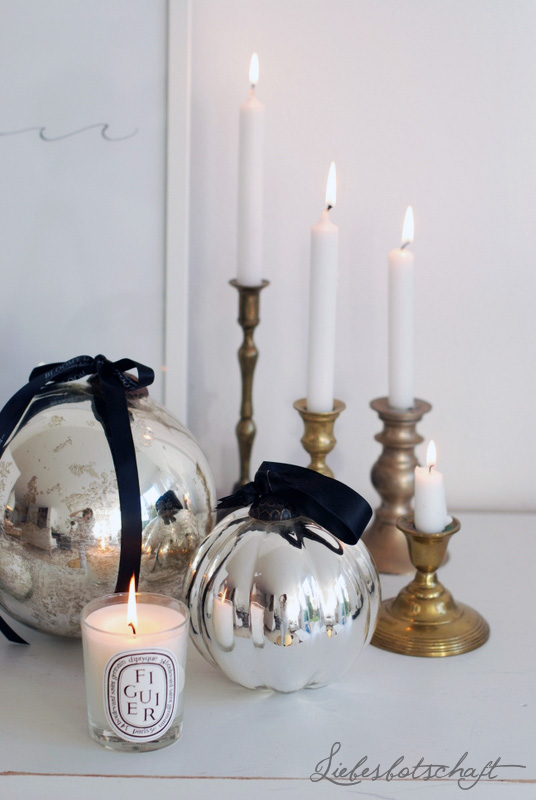 This year I decorated with an emphasis on high-quality scented candles – it adds an elegant touch to the whole picture and has a sophisticated feel. 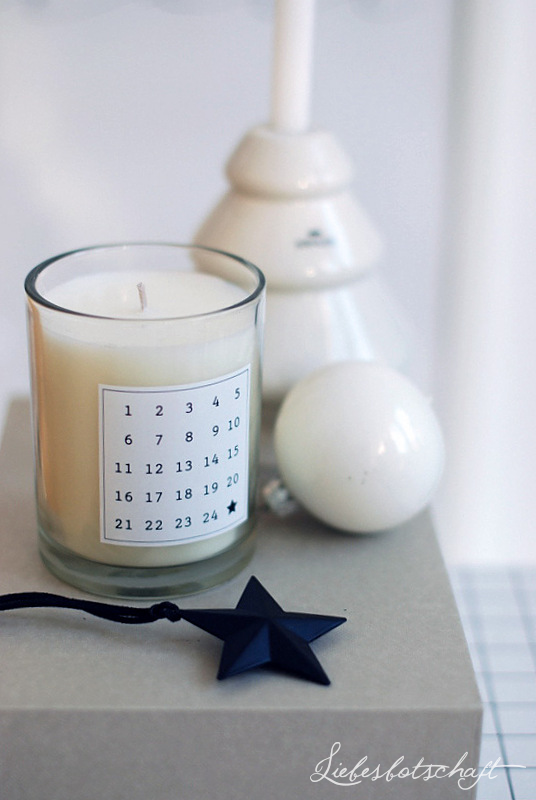 My favorite Diptyque candles were used (they occupy the horizontal spaces anyway), as well as the new Isle of Wolf ones and the advent candle by Tine K. home, which exudes a wonderful pine scent this year. It is important to make sure that the fragrances are really very delicate and pleasant and are made without the use of synthetic ingredients, so that they don’t trigger headaches. A lovely contrast to this arrangement are the slim brass candle sticks from the flea market – they are ones that I purchased more than a year ago, originally for this purpose and the have remained an inherent part of the living room ever since. 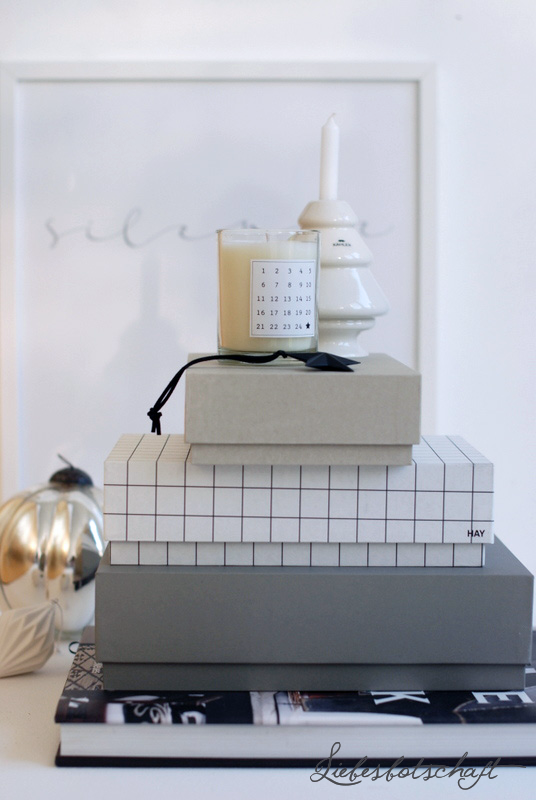 Decorative gift boxes form a calming backdrop to baubles and candles. 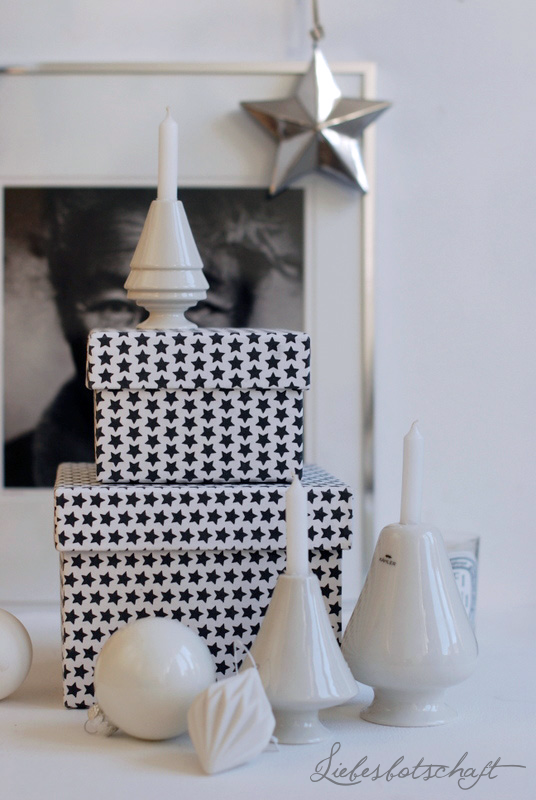 I still had some left over ones by Tine K. Home from last year, while the box set by Hay is a brand new addition. Very convenient: they do not feature any Christmas-related motifs and can be used all year round. instead of the usual tall candles I decided to simply use votives this year – as I never care at all for the burned down leftover bits of candles that remain on the wreath so unattractively after each advent Sunday. 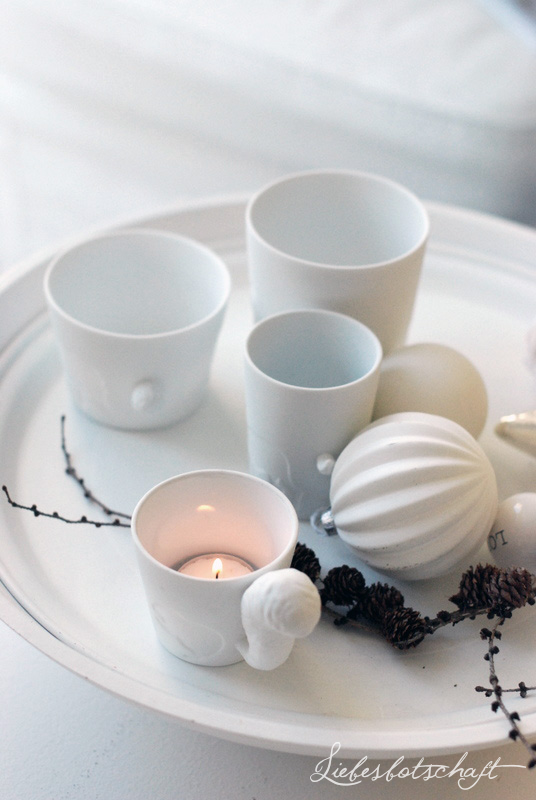 The Mugtail cups by Kinto are wonderfully transparent – and can be used as drinking cups after advent is over! There are delightful new animal motifs this year, such as reindeer, horse or dog, so everyone can discover their favorite. Particularly pretty: since height and width of the cups are all different, they create a fantastic visual effect as a group! 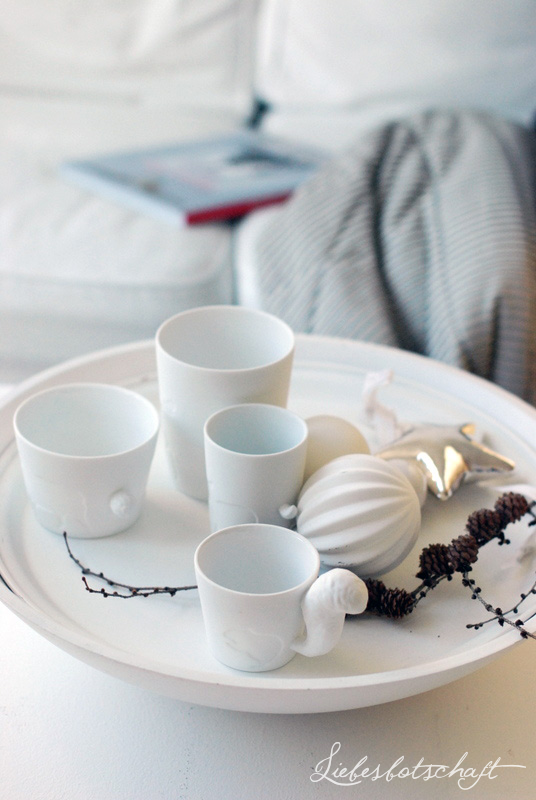 4 of them on a tray, add a few baubles – done! Snack Select carries a calendar this year that allows you to fill the individual cups with organic nuts, dried fruit and other trail mixes. Ideal for all who need brain food, for example students or college students etc. – but also great for people who don’t only like sweet things. You can order the calendar at Snack Select. You will receive 20% off your entire purchase! I hope you enjoy making things pretty, very relaxed, without pressure with regard to time or performance, as it is my belief that not everything has to be perfect before December 1! Main thing everyone is having a good time, right? When we were strolling around town yesterday, we wandered into a corner shop: apart from numerous books there were uncountable and very fragile Christmas baubles. Nothing that didn’t exist in form of a glass bauble: small sparkling hedgehogs, Volkswagen beetles with trees on top, nutcracker figurines, etc. etc. – I admit I was a little…intoxicated. Thank you so much, Eva Ginnell, for translating this post!